Perhaps the highlight of the “off-season” in motorcycling is the cavalcade that is the Progressive International Motorcycle Shows which comes to seven major markets every year. This year’s show season offers several new attractions that are proving to be pretty popular. We thought it would be helpful to make our “Top Ten” list on why you should attend the International Motorcycle Show when it swings through your part of the US. Here Goes! #9: Free Motorcycle Gear Check & Free Bike Parking (at least in Long Beach & Dallas)- If you can bear the winter chill and ride to the show, you can check your gear for free and not have to worry about it on the show floor. There’s even free parking for motorcycles at the Long Beach and Dallas tour stops. #8: The Kids Zone Presented by Allstate- The Kids Zone joins Discover the Ride in partnership with Stacyc, featuring a closed course of battery-assisted balance bikes for children to experience riding for the first time, which are the ideal way to introduce riding to kids. Participants will have the option to ride the balance bikes with or without the addition of a speed limited electric motor depending on their skill. The recommended minimum age/weight is 3 years to 75 pounds, but each child will be assessed before entering the Kids Zone course. #7: Progressive Chop Shop- Flo's Chop Shop is back at IMS this year to provide the premier services you've come to expect from Progressive. Whether you're looking to relax with complimentary massages, airbrush tattoos and hair braids, the Chop Shop has you covered. When you come by the Chop Shop space, don't forget to tell us if you're a Progressive policy holder to get a Progressive VIP gift too! #6: Adventure Out! Hosted by Backcountry Discovery Routes- Adventure Out! is a space to learn, explore, and share the adventure of life on two wheels. Non-profit organization, Backcountry Discovery Routes® (BDR) will be the official host of Adventure Out! during the 2018-2019 IMS Tour. The Adventure Out! exhibit space encourage attendees to get out and ride, and features leading brands in the adventure and touring segments and guest speakers sharing stories about their experiences on two wheels. Come kick back at our moto campsite, take a virtual ride on the a BDR, interact with experienced riders and listen to their stories and tips. #5: Discover the Ride- If you’re brand new to the sport or just considering the thrill of motorcycles in the future, then Discover The Ride is for you. Come experience the thrill of two wheels! Discover The Ride invites new and experienced riders, from toddlers to adults, to enjoy five interactive riding zones. Don't ride yet? Come learn how! A new series of online videos (coming soon!) matched with a series of live presentations at IMS, educating new riders on the world of motorcycling. New To 2 videos and live presentations at the show are hosted by Monique Filips and Jordan Diggs, as well as surprise guests in certain markets. #4: IMS Vintage: Into vintage and classic motorcycles? Than IMS Vintage is right up your alley. See what's new with the old at this top-rated IMS attraction. You'll be up close and personal with the very best of vintage, classic and retro-style motorcycles from vintage bike clubs from across the country. Not only will you get a chance to see some of the best vintage and classic bikes in the country; but you can network with the following club members for advice and such for your own project if you need it. #3: The Marketplace Presented By Cycle Gear- The Marketplace presented by Cycle Gear is an interactive retail space allowing you to touch, test, and buy the latest gear, parts and accessories from key aftermarket brands. Specialists will be on hand to educate, introduce products, answer questions and help you finalize your purchase. #1: The Latest Bikes- Nothing is as cool as being able to check out the latest rides from manufacturers, especially if you live in a place that’s too cold to ride. With factory and dealer representatives on hand to answer questions as well as help you check out their latest offerings, no other show allows you to check out all the latest bikes in one place. After all, it is the United States’ leading motorcycle show! This is Las Flores Canyon Road in the Santa Monica mountains northwest of Los Angeles. 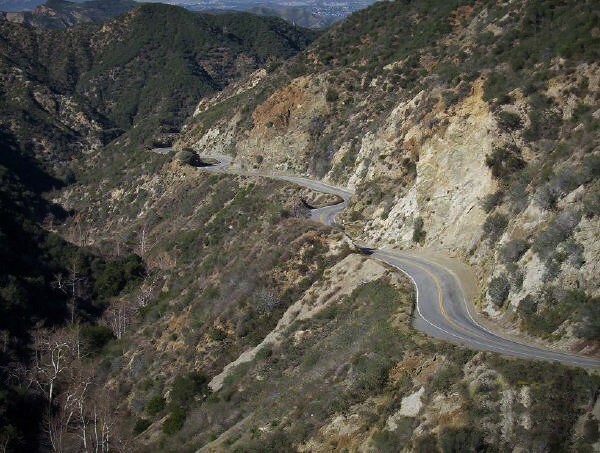 Las Flores Canyon Road is not very far from our headquarters, and it is one of several roads we test ride our gear on. Las Flores Canyon Road features over 55 turns in just under 5 miles. We use it to test our luggage systems and how they mount to a bike. Why? Because the most important aspects of making great soft luggage are two-fold- ensuring a secure and stable fit to your bike and protecting your bike’s finish from scratches and wear when luggage is mounted and packed and you’re out riding aggressively. That is why we love Las Flores Canyon Road as well as several other of the best riding roads near our HQ. It’s a veritable test bed of luggage mounting stress tests. Roads like these allow us to examine weight shifts of packed luggage, the effects of bike vibration, buckle and strap strength and a host of other key variables that are Vunique to mounting soft luggage effectively on a motorcycle. Carying speeds. Varying conditions over long distances. Tight corners. High speed sweepers. Hard braking. All part of the laboratory that helps us ensure a secure and stable fit for our luggage products and that your bike will remain protected once the soft luggage is mounted. Let us be clear, hard luggage has its place and there are plenty of great hard bag systems on the market. If you’re riding around the world on an adventure touring ride and need to literally live off your motorcycle, hard luggage is a great option. But there are some sacrifices with hard bags. They are expensive. Most hard bag systems are anywhere from $600 to over $1200 with the mounting systems and hardware needed. Hard bags are also fairly heavy, typically adding 40-60 lbs. of sprung weight to the bike before they are even loaded with gear. Even heavier if a solid top case is included in your luggage set-up. Soft luggage is much lighter and usually doesn’t need extra mounting hardware. If you’re going on a weekend overnight tour or something less demanding than a global adventure, soft luggage is a great option. What you give up, to some degree, is some severe weather resistance (especially in a driving rainstorm) and some luggage security when you’re away from your bike. Soft bags are also much less of an investment in both cost and in pre-ride set-up. For riders who tour only sporadically in decent weather conditions soft luggage is often the best option. Smaller tail sections, shorter pillion seats, gas tanks of both plastic and metal. The quest for bike makers to make something sleeker, faster, lighter and more stylish has made mounting luggage more of a challenge. That’s why we offer luggage options with highly versatile mounting systems that often include straps of varying lengths, extensive removable neoprene or other low impact materials on base areas that may touch and rub on a bike at speed. Our saddlebags will integrate with our matching tailbag with robust quick-release mounts (in addition to sturdy hook and loop straps and additional straps) that combine to offer great adjustability with a convenience in removing bags once your done with the ride. Our bags’ zippers tuck into little pockets to help avoid scratches on sensitive paint or plastic areas. With a variety of attachment systems and strap options combined with the ability to integrate saddlebags and tail bags together, we’ve found our bags to be perhaps the easiest to mount to a variety of bikes securely and safely. Plan your mounting well before you finally take off on tour. Nothing is as bad as trying to mount luggage quickly without proper adjustment and finding problems 100 miles down the road. Mount the luggage empty and somewhat loosely, and then pack it and either remount it or pack it on the bike before your start on day one. Once packed, tighten and secure all the straps and connection points. Make sure that shiny or painted surfaces that contact the luggage are covered by our low impact materials like neoprene and that the bags don’t move. It really helps to ensure these surfaces are clean and dust free as well. Double check strap tension and hook and loop connectors as well as any quick release mounts being secured. It’s also a great idea to ensure that straps are not tensioned against breakable parts like rear turn signals or reflectors. Stress these parts with a strap under tension may result in something breaking from the weight of fully-loaded luggage under stress from accelerating, braking, or shifting during a ride. What you want is a solid stable mount for all bags that is relatively tight, thus suspending the bags from any large movement, but isn’t so highly taut that something may bend or break on the bike at speed under the forces of riding, turning, accelerating and braking. Once you are satisfied that your packed luggage is secure on all points, mount up and ride for 5-10 minutes and then do a quick stop and re-check all your straps, connectors and quick-releases to ensure nothing has shifted or sagged since you started. This check is especially important on the first day of a tour. While a bit inconvenient, this quick check will easily identify if fully packed saddlebags or tank bags are mounted too loosely and have shifted to one side of the bike or if saddlebags have started to sag onto a hot exhaust canister which over time can melt the textile material and possibly damage packed gear over time. A bit of pre-ride planning fot mounting soft bags and that five-minute check are great ways to avoid any problems that might show up after 100 miles at speed or more. It doesn’t hurt to re-check on gas or lunch stops too. We know all this, because we test our bags relentlessly on roads like Los Flores Canyon Road. Get some bags and do some overnight rides. You’ll be really glad you did. Motorcycle gloves are often the one piece of gear that most riders replace season to season, or even ride to ride. Gloves wear out with mileage, different gloves are called for with different riding styles and bikes, varying weather conditions and such all contribute to the need for optimum glove performance. Knowing this begs the question- what makes a great a pair of motorcycle gloves? In answering this, we thought we’d share the key things we look for when we develop Tourmaster motorcycle gloves. Tourmaster has one of the widest glove product lines in the business, so we freely admit we obsess over these issues and we hope you do too. We hope you look for and will consider these topics the next time you’re purchasing new riding gloves. Glove fit is often as important as the fit for boots. After all, your hands and feet are key touch points in controlling your bike effectively and safely. When shopping for gloves it’s important to look for proper fit in the fingers. Not too tight, but certainly not too loose either. After all you don’t want your fingers on your braking hand swimming around when you’re on the binders when it matters. Just as important is proper fit in the palms. You want to avoid any bunching of the glove material when your hands are wrapped on the grips (a sure sign your gloves are a bit too big), as this will cause you palm discomfort when you’re on the grips after a few hours. Also fit at the wrist, relative to the type of jacket you’re wearing is also important- especially on your throttle hand. If the wrist fit is too tight under your jacket, will these gloves be comfortable when you’re on the throttle and your wrist is bent? If the glove has a gauntlet will it comfortably go over your jacket’s wrist closure to keep you warm and dry without being too tight hour after hour? All thoughts to consider. We know certain riders, when shopping for gloves at a shop will take a pair under consideration and head to the new bike department to grip a dealer’s new bike’s bars right in the showroom- just to “feel” what the gloves are like in a riding scenario. Smart. Way smarter to know this before you buy vs. having sore hands, or worse; after eight hours in the saddle, hundreds of miles from home. Equally important are a glove’s protection features. Padding and reinforcement in the right areas in case of a shunt are key. Looking for the type of protection that gives peace of mind for the type of riding you’ll be doing. Leather and goatskin are great abrasion resistant materials, but reinforced thread in key impact areas, extra leather in those same impact areas as well as robust gauntlet or wrist closures that will help keep the gloves secure when it goes bad are just as important All need to be carefully considered for the type of riding you’ll be doing. The higher the anticipated riding speed, the more protection we look for and so should you. Give your riding climate real thought and be prepared with as wide an assortment of glove options you feel are necessary. What you want to avoid is hand discomfort from either being too cold- resulting in a loss of hand feel on the controls or too warm. That’s one of main reasons Tourmaster’s glove line is so varied, in that in being a leader in motorcycle gloves, we know we must have all types gloves for all types of riders on all types of bikes covered. So consider carefully the next time you’re updating your motorcycle gloves. We always do. Have a great ride. The riding gear you select directly affects the overall quality of your motorcycling experience, for better or for worse. Choose the wrong gear and you can be too cold, too hot, windblown, soaking wet and more—all in the course of one ride. More important, inferior riding gear or failure to wear protective equipment will leave you exposed to greater risk in the case of an accident. The right stuff, however, delivers elevated levels of comfort, convenience, adaptability to changing weather conditions and more—all of which can boost your riding confidence and make the trip much more fun. Today’s motorcyclists are blessed with a rich assortment of choices in riding gear, although at first glance such a wide variety may seem a bit bewildering. But once you get familiar with some of the key elements that go into the best designs, it’s easy to zero in on gear that will suit your needs and fit your fashion tastes as well. So here’s a quick review of some important features to look for when you set out to make your purchase. Riding gear made specifically for motorcycling is essential; these pieces offer a level of safety, comfort and function that cannot be matched by run-of-the-mill fashion wear. Riding jackets and pants can be divided into two general categories, both of which work very well: leather and textile. Built correctly, both serve to resist abrasion to your body parts in the event of a get-off. If you think your favorite denim jeans are tough enough for the job, think again; fashion denim impacting asphalt at speed can come apart on impact, leaving nothing between your skin and the road. Ouch. Leather garments should have a thickness of 1.0mm or more; that’s noticeably thicker, stiffer and heavier than the soft, easy-to-tear stuff used for fashion wear. Textile gear should incorporate tough, high-quality synthetics ranging from about 500 denier and upwards (“denier” refers to the density of the fabric). Well-built textile suits will also include sections of heavier material in critical impact areas such as the knees, elbows and shoulders. Good riding gear will also feature body armor in these vital areas as well as a back protector to help absorb impacts in a crash. Look for armor that is “CE” rated to meet Certified European safety standards. If you live in a climate that regularly features hot weather, a jacket and pants with a mesh shell plus CE armor in the shoulder, elbows, knees and often in the back can be a valued option within your riding wardrobe. Garments designed for the rigors of motorcycling will also incorporate double- or triple-stitched seams for added durability, plus a riding-oriented cut featuring pre-curved, rotated sleeves, expansion panels, mandarin collar and a longer tail on the jacket. Take-up straps and adjustable waist belts allow for a snug fit that won’t let the wind whistle up your sleeves or allow your jacket to flap annoyingly in the wind whether you’re layered up for cool weather, or pared down in hotter temps. A zip-out thermal liner, breathable and waterproof layer, and easy-to-use vents go a long way towards keeping you comfortable from sunup to sundown. Road-wise riders also fully understand the value of having an electric vest or jacket liner on hand to add to the mix when temperatures drop below 50º Fahrenheit. A large assortment of pockets is important for travel by motorcycle; you need to keep your wallet, cell phone and other items secure while riding, and hand warmer pockets come in handy when you’ve parked your bike. As a last thought, look for riding gear that incorporates reflective elements for enhanced nighttime conspicuity. Regardless of local laws that may or may not mandate helmet use, smart riders wear a helmet on every ride. All motorcycle helmets sold in America must have a sticker signifying DOT approval; for helmets built to a stricter standard, look for approval by the Snell Foundation. Every person has a unique head shape, so a first-time purchase is best done in a brick-and-mortar store. Look for helpful salespeople who will not only allow you to try on different brands and sizes to find the right fit, but will also let you wear it for an extended time while in the store. Such extended wear allows you to determine whether or not a certain helmet creates uncomfortable pressure points over time—you can’t get a proper evaluation by slipping the helmet on and off after a few seconds. You’re looking for a snug fit here; the helmet shouldn’t move about appreciably on your head when you try to rotate it. If you wear glasses, look for helmets that incorporate a channel that easily admits the arms of your particular style of glasses, for a proper and comfortable fit. For added comfort, look for a helmet that incorporates adjustable vents that permit entry of extra airflow around your head during rides in warm weather. A lighter helmet may cost more, but less weight results in less fatigue over a long ride. Better designs have also undergone extensive wind tunnel testing for superior aerodynamics and reduced wind noise, which are also important factors for reducing rider fatigue. A removable, anti-bacterial helmet liner is essential for easy cleaning, and many helmets offer a range of cheek pads to allow a more comfortable, customized fit. Add to all this some motorcycle-specific riding gloves and sturdy motorcycle boots, and you’re ready to roll. When you decide to ride a motorcycle, understand that you’re also making a commitment to wear proper riding gear—every time you ride.